On my way home today I was cruising along a busy part of Brookhurst Ave. in Anaheim California. As traffic came to a halt, a silver Honda Accord blocked my path. I tried to manuever around the car by going as far right as I could on the street. 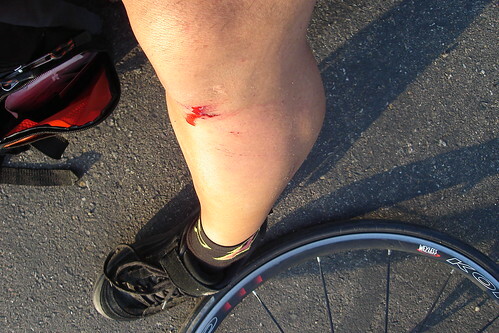 But that was a huge mistake, my front tire slipped on a puddle and I quickly fell. On my way down to the ground, I hit the Honda Accord. I didn’t just tap the trunk, I hit it with some force, loud enough and hard enough to be heard and leave a mark. Rather than the car stopping, he or she just drove off! Lucky for him or her since I don’t think my insurance would cover me hitting a car while I’m on a bicycle. This is where shaving my lower half of my legs is a benefit. It’s easier to clean and bandage. By the way, the bike is ok! I’m glad the bike’s ok! Check out the stubbles on your leg. You might want to hit that up with a lady bic. Good to hear that youre ok. I stupidly played wrong-way-sidewalk-cyclist yesterday, swerved around a utility pole, my messenger swung out and caught the pole and down I went.